Trabakul Larus is sailing old timer from 1930. 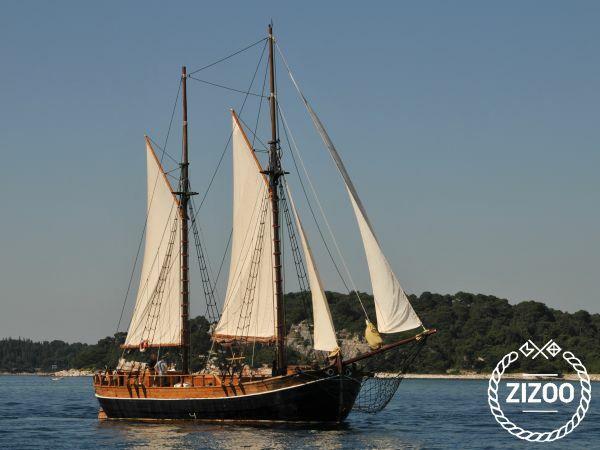 It is fully restored and have all equipment you need for sailing. Larus is also protected heritage of Croatia so its make him more unique. Our experienced crew is in this business for 30 years and we are ready to give you all service you can imagine on boat. We are also sailing school certificated by American Sailing Association and we offer some of sailing courses. On our Old timer Larus we offer traditional sailing school witch is unique in this area. Larus is made for daily trips but it is also possible to rent it for a week with organized accommodation by your choice ( not on the boat).We have more than 30 years of experience in nautical tourism and we can offer you a lot of interesting entertainments such as wedding on boat,sailing school,birthday party,commercial,dinner with chef on boat and a lot of others.